ASX Designed in 1942 and built in 1943. 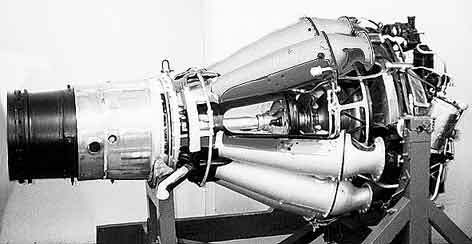 The AWX was a 14 stage axial-flow engine making around 2,600 lb of thrust. Never used in any production aircraft, how ever it was developed into a turboprop engine delivering 3760 hp, known as the ASP and given the name "Python". This engine was fitted into the Westland "Wyvern"
Designed by Frank Halford after a contract was given to de Havilland to design and make a new jet powered fighter in early 1941(DH 100). 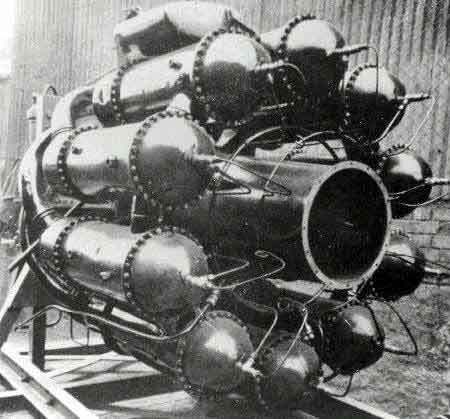 The work on the "H-1 Supercharger" which would become the "Goblin" engine started in April 1941. A centrifugal-flow design with 16 straight-through combustion chambers (instead of Whittle's reverse-flow design). The first engine was on the test bench by 13/4/1942, with over 200 hours ruining by September that year and producing around 2,300 lb of thrust. The H1 "Goblin" would power the first flight of the Gloster "Meteor" on the 5/3/1943, Britain's first twin engined jet powered aircraft. Used in the DH 100 "Vampire", Meteor Mk II and Lockheed XP 80. 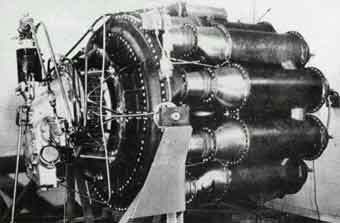 An uprated H-1 engine called "Goblin II" and making of 3,100 lb of thrust, fitted in the Vampire Mk-1 from the 41st aircraft onwards and the SAAB J 21-R.
As far back as 1939, Metropolitan-Vickers, a Manchester firm that specialized in steam turbines, had been working on what would become the first British axial-flow turbojet engine. The company had been working on a turboprop design as early in as 1939 but this idea was proving overly complicated. By 1940 the success of the Whittle engines suggested a turbojet might be a better road to go down.. Work began in July 1940, on an axial-flow engine designed by Hayne Constantit at the RAE, with a nine-stage compressor, an annular combustion chamber, and a two-stage turbine, By November 1941, the F.2 was was producing 1,800 lb of thrust on the test bench, with flight tests beginning in the spring of 1943 with the engine fitted in to a Avro Lancaster and then into a modified Gloster Meteor DG204/G which had it's first flight on the 13/11/1943. The F.2 was refined into the operational "F.2/4", with a ten-stage compressor, single-stage turbine, with 3,230 lb of thrust. Fitted in the Sanders-Roe SRA.1. In 1936 a small "firm named "Power Jets LTD" set up to work on the engine designed by Frank Whittle in March 1936. 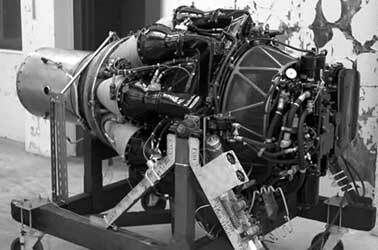 The engine was his first turbojet a bench-test unit burning diesel oil and designated the "Whittle Unit (WU)". The engine it self was very simple, featuring a single two-sided centrifugal rotor; a single large combustion chamber; and a single-stage axial turbine. Whittle managed to get a number of firms to build the components. A contract was given in June 1936 to BTH, to build the engine, it was first run on the 12/4/1937. There were a number of technical problems with the new form of engine but in the end these were overcome, but on the 6/5/1938 the engine failed . In 1939 the British Air Ministry ordered a flight ready engine from Power Jets, this would become the W.1. 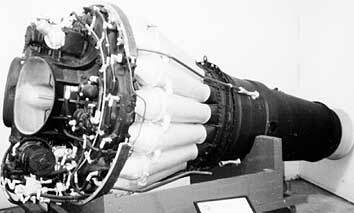 Designed by Frank Whittle it was a centrifugal type turbojet, with ten small reverse-flow combustion chambers, the first engine the W.1X was tested on the 14/12/1940. W2 Despite this success, Power Jets was not in a position to mass-produce the Whittle engine themselves, and in October 1940, the Air Ministry arranged for production of the W.2 by Rover. Unfortunately, Frank Whittle and the Rover management worked at all times at cross purposes, with Rover always believing (wrongly) they had better ideas and did little to cooperate. The confusion was aggravated by contradictory instructions from the British Ministry of Production. It could be said that they did all they could to kill off Whittle's engine, with the jet engine development effort slowly strangled on its own red tape until late 1942. Rover managed to make only around 20 engines! in the two year of production, delaying the introduction of Gloster Meteor fighter by some time. W2 Rolls-Royce engineering staff had been working on a turboprop engine with Dr Griffith since 1939 and saw the value of the turbojet engine, when in mid 1942 Rolls-Royce's Ernest Hives took S.B. Wilks of Rover out to lunch and in a deal with Wilks the production and development of the Whittle engine was swapped for the Vickers Tank plant in Nottingham. The British Air Ministry was more than happy with this arrangement hoping that the jet engine had finally got on track. It had Rolls-Royce and the jet engine took to each other like a "duck to water". Working with Whittle to finally get an uprated version of the engine in production, the production version of the W.1 engine the W.2 was soon coming off the production line in an ever increasing rate. The W.2B made 1,600 lb of thrust by this time. Rolls-Royce named the new engine the "Welland ", beginning the Rolls-Royce tradition of naming their engines after British rivers. The Welland was fitted to the first production Gloster"Meteor" Mk I. All of the "Whittle type engines until 1943 were reverse-flow centrifugal engines. Rolls-Royce reworked the design to feature straight-through combustion chambers and better fuel and oil systems, similar in lay out to the de Havilland H-1, all this work resulted in the "Derwent I",which made 2,000 lb of thrust and used less fuel. Ran for the first time on the test bench in July 1943, the "Derwent I" was fitted to a Gloster Meteor in March 1944, and would powered the Gloster "Meteor Mk III" after the 15th aircraft. 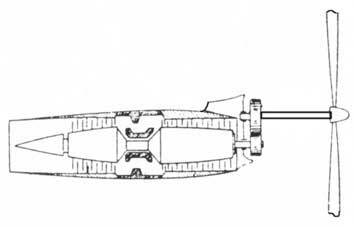 The Derwent was refined various versions up to the "Mark IV", which made 2,450 lb of thrust. At the time the Nene was the world's most powerful engine plus it was simple, cheap and reliable. Built under license in Australia, France and was to be built under license in the USA by the Taylor Turbine Corporation as the J42-TT-2 as the "J-42", it powered early versions of the US Navy's Grumman F9F Panther fighter, however since the the J42 was not going to be ready in time to be installed in the XF9F-2, Taylor Turbine Corporation supplied six imported Rolls-Royce Nene turbojets to Grumman. 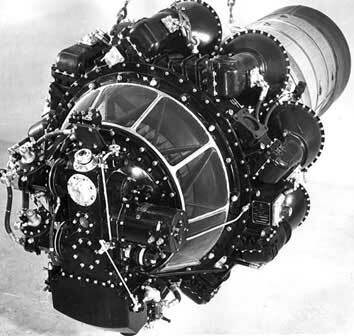 By 1948 the US Navy was fearful that the Taylor Turbine Corporation might not be able to deliver sufficient numbers of engines so the Navy encouraged Taylor to negotiate an agreement whereby the Nene manufacturing license would be transferred to a more-established engine manufacturing company. This was done as requested, and the Nene license was purchased from Taylor by Pratt & Whitney. Who would collaborated with Rolls-Royce to develop a version of the Nene with water injection, this version of the engine the "J-48", powered later versions of the Panther and its swept-wing Cougar . Also the Nene was built in large numbers in the USSR. In 1946, a Soviet delegation went to Britain and came back with new Nene engines. Named the RD-45 and later the VK-1,it was powered the MiG-15 and most other jet aircraft in the USSR for some time. The Chinese also built a copy of the engine, only finally ceasing production in 1979. 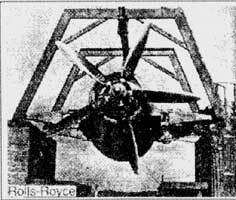 The Nene was very a good engine but it could not be used in the Meteor with out a major redesign because of it's greater size, In 1944 Rolls-Royce proposed to build a scaled-down version of the engine to fit the Meteor, this they did and had it up and ruining with in 25 weeks and producing 3,000 lb of thrust. Based on a converted Derwent engine, the "Trent" was fitted with a reduction gearbox and a five-blade Rotol propeller, having it's first flight on 20/09/1945, fitted on a converted Gloster Meteor Mk-I. 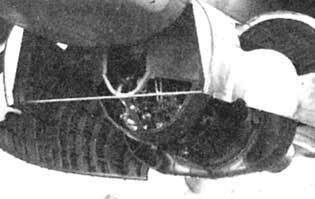 This primitive turboprop engine was designated RB.50" Trent". It however left much to be desired, but as an experimental engine it provided much useful feedback. The "Trent" name would be used again for a more successful turboprop engine.